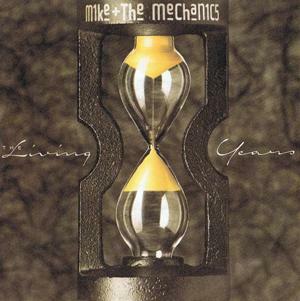 The Living Years single was the title track from Mike & The Mechanic's second album, and peaked at #2 in the UK in 1989, but was a #1 in the U.S., Australia and Canada. The ballad was penned by Mike Rutherford and B. A. Robertson and produced by Christopher Neil. It was initially thought that lyrics were about a dispute between Rutherford and his recently deceased father. However, an interview with Rutherford revealed that they were penned by B. A. Robertson and were about the lack of communication with this own father who had also died. The B-side on all versions of the single was "Too Many Friends". The video was directed by Tim Broad who also directed "Nobody Knows" for the band. He is better known for producing music videos for the ex-Smiths frontman Morrissey. Sadly, Broad died in 1993 aged just 38 from an AIDS related illness. The first quarter of the video features Mike Rutherford with his son, Tom, who was 8 years old at the time. It was filmed near Porlock Weir in West Somerset, England. We then see the band performing with a choir - Look out for Maggie Jones who played Blanche Hunt in Coronations Street. She sadly passed away on 2nd December 2009. The band's only other hit song in the UK was Silent Running (On Dangerous Ground) which reached #21 in 1985. The debut album - the self-titled Mike + The Mechanics - failed to chart in the UK, but was a hit in many other countries. This is not to be confused with their fifth studio album of the same name which reached #14 in the UK album charts in 1999, and is referred to as M6 to avoid confusion. Mike & The Mechanics were created by the founder of 80's rock band Genesis as a "side project", although the band went on to become successful in their own right.